Coding and technology are a daily part of kids’ lives, so it’s important that they learn to harness it. 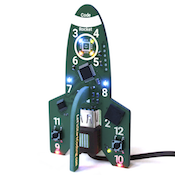 With the kits from Let’s Start Coding, boys and girls age 8 - 12 will learn about electronics and coding by building real circuits and writing real code. Total beginners can follow over a dozen lessons that teach them the basics of reading and modifying C++ typed code. Projects include blinking LEDs, making songs on a speaker, and using buttons and sensors as inputs.
" I purchased this kit for my 11 year old grandson and he told me he really likes it. His goal is to attend Georgia Tech and major in computer engineering. This is a good start along with his current classes in middle school. " " My 8 year old grandson loves working with the kit with his dad. Very happy with this purchase. I recommend it to get young learners started. " The Let’s Start Coding experience goes well beyond pieces in a box. Our free software allows kids to follow along and learn coding by doing it. 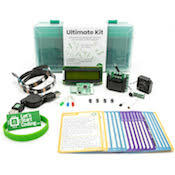 Each kit contains at least 12 lessons that teach the basics of coding and have video tutorials, challenges, and a glossary of terms to help science-minded kids learn all about the world of coding. 2) Download our free software & follow 12+ lessons. Setup takes only 10 minutes. 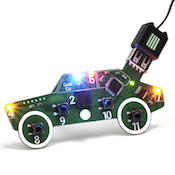 3) Watch a curious child become a coding master! Rather than watching kids get mesmerized by the latest thing on their screen, you can be a part of their code learning experience! Help your young engineer set up the coding software and dive in right beside them- you may even have fun, too! For a limited time, use the coupon code GIFT at checkout to save 10% on any kit in our store.